Somali pirates attacked the Maersk Alabama on Wednesday for the second time in seven months, though private guards on board the U.S.-flagged ship repelled the attack with gunfire and a high-decibel noise device. A U.S. surveillance plane was monitoring the cargo ship as it steamed on to its destination. Pirates hijacked the Maersk Alabama last April and took ship captain Richard Phillips hostage, holding him at gunpoint in a lifeboat for five days. Navy SEAL sharpshooters freed Phillips while killing three pirates in a daring nighttime attack. Somali pirates attacked the ship with automatic weapons early Wednesday about 350 nautical miles east of the Somali coast, but guards on board the craft fired back and thwarted the attempted hijacking. Cmdr. 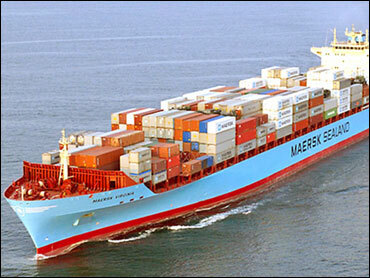 John Harbour, a spokesman for the EU Naval Force, called it "pure chance" that the Maersk Alabama had been targeted a second time. "It's not the first vessel to have been attacked twice, and it's a chance that every single ship takes as it passes through the area," Harbour said. "At least this time they had a vessel protection detachment on board who were able to repel the attack." An EU patrol aircraft from the Horn of Africa nation Djibouti was called in to investigate, and the closest EU Naval Force vessel was tasked with searching for the pirate attack group, the EU Naval Force said in a statement. Phillips' ordeal last spring galvanized the attention of the U.S. public to the dangers of operating merchant ships in the Horn of Africa, one of the busiest and most precarious sea lanes in the world. Pirates have greatly increased their attacks in recent weeks after seasonal rains subsided. On Monday, a self-proclaimed pirate said that Somali hijackers had been paid $3.3 million for the release of 36 crew members from a Spanish vessel held for more than six weeks  a clear demonstration of how lucrative the trade can be for impoverished Somalis.